by Abram Hoffer, M.D., Ph.D.
Hoffer A. Niacin, Coronary Disease and Longevity. J Orthomolecular Medicine 4:211-220, 1989. In 1954, it was impossible to predict or even to think that my bleeding gums would one day, 31 years later, lead to additional useful life to people with coronary disease related to cholesterol and lipid metabolism. That year, malocclusion of my teeth had broken down the ability of my gum tissue to repair itself quickly enough. Because my bite was not correct there was too much wear and tear on tooth sockets and my gums began to bleed. No amount of Vitamin C and no amount of dental repair helped. Eventually I reconciled myself to the idea I would soon have all my teeth extracted. But at this time I had been treating schizophrenics and seniles and a few other diseases with niacin, and I began also to take this vitamin, 1 gram after each meal, i.e. three grams per day. I did so because I wanted to experience the flush which comes when one first takes niacin and its gradual waning with continuing use so I could discuss this reaction more know-ledgeably with my patients. There was also a legal issue ― most doctors’ defence against malpractise suits is that they were doing what any other similar physician would do it like circumstances. If I were sued (I have never been sued) because of unusual discomfort or because of adverse effects from niacin, I would not be able to use that defence since only a handful of physicians had ever used these large quantities of niacin. I had concluded that if the unlikely did occur and I was charged with malpractise, one of my defences would be that I had tried it myself for at least three months without suffering any serious consequences. I must admit I had not discussed this with any litigation lawyer. My reasons were therefore both practical and paranoid. I had no intention of treating myself or my bleeding gums. Two weeks after I had started taking niacin my gums were normal. I was brushing my teeth one morning and suddenly awakened in surprise ― there was no bleeding whatever! A few days later my dentist confirmed my gums were no longer swollen, and I still have most of my teeth. Eventually I reasoned that the niacin had restored the ability of my gum tissue to repair itself faster than I could damage it by chewing with my crooked teeth. A few months later I was approached by Prof. Rudl Altschul, Chairman, Department of Anatomy, College of Medicine, University of Saskatchewan. He had taught neurohistology and I had been one of his students. Prof. Altschul had discovered how to produce arteriosclerosis in rabbits. He fed them a cake baked by his wife, Anna, which was rich in egg yolks. Rabbits fed cooked egg yolk promptly developed hypercholesterolemia and later arteriosclerotic lesions on their coronary vessels, Altschul and Herman (1954). Altschul had also discovered that irradiating these hypercholesterolemic rabbits with ultraviolet light decreased their cholesterol levels. He wanted to extend this research by irradiating human subjects, but not one internist in Saskatoon would allow him access to their patients. People who bake in the southern sunshine may wonder why this “dangerous” treatment received such a negative response. Prof. Altschul thus approached me, as Director of Psychiatric Research, Department of Health, Saskatchewan, I had access to several thousand patients in our two mental hospitals. I agreed to this provided that Dr. Humphry Osmond, Superintendent of the Saskatchewan Hospital at Weyburn also agreed. This treatment was innocuous, would not cost us anything and would help us create more of an investigative attitude among our clinical staff. But before we started I requested that Prof. Altschul meet with our clinical staff and present his ideas to them. A few weeks later he came to Regina by train and I drove him to Weyburn in my car to meet Dr. Osmond and his staff. On the way down and back we discussed our work. He gave me an interesting review of how he saw the problem of arteriosclerosis, which he considered to be a disease of the intima, the inner lining of the vessels. He hypothesized that the intima had lost its ability to repair itself quickly enough. As soon as I heard this I thought of my bleeding gums and of my own repair hypothesis. I then told him of my recent experience. I asked him if he would be willing to test niacin which if it had the same effect on the intima as it had had on my bleeding gums might have antiarteriosclerotic power. Prof. Altschul was intrigued and agreed to look at the idea if he could get some niacin. I promptly sent him one pound of pure, crystalline niacin from a supply I had received earlier, courtesy of Merck and Company, now Merck, Sharp and Dohme. One evening about three months later I received a call from Prof. Altschul who began to shout, “It works! It works!” Then he told me he had given niacin to his hypolipidemic rabbits and within a few days their cholesterol levels were back to normal. He had discovered the first hypocholesterolemic substance. Drug companies were spending millions to find such a compound. But did it also work in humans? The next day I approached Dr. J. Stephen, Pathologist, General Hospital, Regina. I was a biochemical consultant to him. I outlined what had been done and wanted his help in some human experiments. I assured him niacin was safe and we would only need to give a few grams to patients. He promptly agreed. He said he would order his technicians to draw blood for cholesterol assay from a large variety of patients, would then given them niacin and would follow this with another cholesterol assay. I suggested we discuss this with the patients’ physicians but Dr. Stephen laughed and said they did not know what went on in hospital and that to contact each one would probably make the study impossible. A few weeks later the data poured in: niacin also lowered cholesterol levels in people. The greater the initial or baseline level, the greater the decrease. We published our results (Altschul, Hoffer and Stephen, 1955). This report initiated the studies which eventually proved niacin increases longevity. Because of its importance, this paper is reproduced here. Note, it was not double blind. However, patients did not know what they were getting or why they were getting it. This type of impromptu research is forever impossible with ethics committees, informed consent and so on. Thirty years ago only the integrity of physicians protected patients against experimental harm. At the same time we were examining the effect of niacin on cholesterol levels, Russian scientists were also measuring the effect of vitamins on blood lipids but they used very little niacin and found no significant decreases, Simonson and Keyes (1961). The only reason for being concerned about elevated cholesterol levels is that this is associated with increased risk of developing coronary disease. The association between cholesterol levels in the diet and coronary disease is not nearly as high even though the total diet is a main factor. The kind of diet generally recommended by Orthomolecular physicians will tend to keep cholesterol levels down in most people. This diet can be described as a high fiber, sugar-free diet which is rich in complex polysaccharides such as vegetables and whole grains. His prediction came true when the National Coronary Drug Study was evaluated by Canner recently. But E. Boyle’s data spoke for itself. Continuous use of niacin will decrease mortality and prolong life. Perhaps Boyle’s study was one of the reasons the Coronary Drug Project was started in 1966. Dr. Boyle was an advisor to this study which was designed to assess the long term efficacy and safety of five compounds in 8341 men, ages 30 to 64, who had suffered a myocardial infarction at least three months before entering the study. The National Heart and Lung Institute supported this study. It was conducted at fifty-three clinical centres in twenty-six American states and was designed to mea-sure the efficacy of several lipid lowering drugs and to determine whether lowering cholesterol levels in patients with previous myocardial infarcts would be beneficial. Niacin, two dosage strengths of estrogens, Clofibrate, dextrothyroxine and placebo were tested. Eighteen months after the study began, the higher dose estrogen group in the study was discontinued because of an excess of new non-fatal myocardial infarctions compared to placebo. The thyroxine group was stopped for the same reason for patients with frequent ectopic ventricular beats. After thirty-six months dextrothy-roxin was discontinued for the rest of this group, again because myocardial infarcts were increased. After fifty-six months the low dose estrogen group study was stopped. There had been no significant benefit to compensate for the increased incidence of pulmonary embolism and thrombophlebitis and increased mortality from cancer. Eventually only niacin, Clofibrate and placebo groups were continued until the study was completed. Dr. Paul L. Canner, Chief Statistician, Maryland Medical Research Institute, Baltimore, examined the data for the Coro-nary Drug Project Research Group. About 8000 men were still alive at the end of the treatment trial in 1975. This new study was begun in 1981 to determine if the two estrogen regimens and the dextrothyroxine regimen had caused any long term effects. High dose estrogen had been discontinued because it increased non-fatal myocardial infarctions, low dose estrogen increased cancer deaths and dextrothyroxine increased total mortality, i.e. compared to placebo, Clofibrate and niacin. None of the subjects continued to take the drugs after 1975. The 1985 follow-up study showed no significant differences in mortality between those treatment groups which had been discontinued and placebo or Clofibrate. However, to the investigator’s surprise, the niacin group fared much better. The cumulative percentage of deaths for all causes was 58.4%, 56.8%, 55.9%, 56.9% and 50.6% for low dose estrogens, high dose estrogens, Clofibrate, dextrothyroxine, placebo and niacin, respectively. The mor-tality in the niacin group was 11 percent lower than in the placebo group (P = 0.002). The mortality benefit from niacin was present in each major category or cause of death: coronary, other cardiovascular, cancer and others. Analysis of life table curves comparing niacin against placebo showed the niacin patients lived two years longer. With an average follow-up of fourteen years, there were 70 fewer deaths in the niacin group than would have been expected from the mortality in the placebo group. Patients with cholesterol levels higher than 240 mg per 100 mL benefitted more than those with lower levels. NIH recommends that the first step in treatment should be dietary and their recommendations are met by the Ortho-molecular diet. But when diet alone is not adequate, drugs should be used. Bile-acid sequestrants and niacin are favoured while the main commercial drug, Clofibrate, is not recommended “because it is not effective in most individuals with a high blood cholesterol level but normal triglyceride level. Moreover, an excess of overall mortality was reported in the World Health Organization trial of this drug.” Since niacin is effective only in megavitamin doses, 1 gram three times per day, NIH is at last promoting megavitamin therapy. The National Institute of Health asked that their conference statement be “posted, duplicated and distributed to interested staff”. Since every doctor has patients with high blood cholesterol levels, they should all be interested. In fact, if they are not, some of them will be facing litigation from angry wives whose husbands have not been treated with niacin for their elevated cholesterol levels. At about the same time Kane, Malloy, Tun, Phillips, Freedmand, Williams, Rowe and Havel (1981) reported similar results on a larger series of 50 patients. They also studied the combined effect of Colestipol and Clofibrate. Abnormalities of liver function only occurred when the dose of niacin increased rapidly. The first month they took 2.5 grams per day, the second month 5.0 grams per day and 7.5 grams per day the third month and thereafter. In a few, blood sugar went up a little (from 115 to 120 mg), and uric acid levels exceeded 8 mg percent in six. None developed gout. All other tests were normal. They concluded, “The remarkable ability of the combination of Colestipol and niacin to lower circulating levels of LDL and to decrease the size of tendon xanthomas suggests that this combination is the most likely available egimen to alter the course of atherosclerosis.” The combination of Colestipol and Clofibrate was not as effective. For the first time it is possible to extend the life span of patients with familial hypercholesterolemia. Fortunately, niacin does not decrease cholesterol to dangerously low levels. Cheraskin and Ringsdorf (1982) reviewed some of the evidence which links low cholesterol levels to an increased incidence of cancer and greater mortality in general. Ueshima, Lida and Komachi (1979) found a negative correlation between cholesterol levels between 150 and 200 and cerebral vascular disorders (r = �C .83). Mortality increased for levels under 160 mg.
Hoffer and Callbeck (1957) reported that the hypercholesterolemic action of niacin was related to the activity of the autonomic nervous system. We referred to a previous study by Altschul and Hoffer where we found on normal volunteers (medical students) that there was a linear relationship between the effect of niacin in lowering cholesterol, the initial cholesterol levels and body weight. The regression equation was Y = 0.95X �C 0.39Z �C 90 where Y is the decrease in cholesterol level in milligrams, X is the initial cholesterol value and Z the body weight in pounds. The multiple correlation coefficient is 0.83. When Y = O niacin has no effect on cholesterol levels. When Y is negative it means the cholesterol levels were elevated by niacin. This might then be a good indication of the optimum cholesterol levels. For a 200 pound patient Y = O when X is 176 mg, and for a 150 pound subject Y = O when X is 156 mg. This is remarkably close to the optimum values recommended by Cheraskin and Ringsdorf and others, i.e. 180 to 200 milligrams. Hoffer and Callbeck found that niacin also lowered cholesterol levels of schizophrenic patients, but the schizophrenic response was represented by a different equation Y = 0.28X -0.43Z + 53. 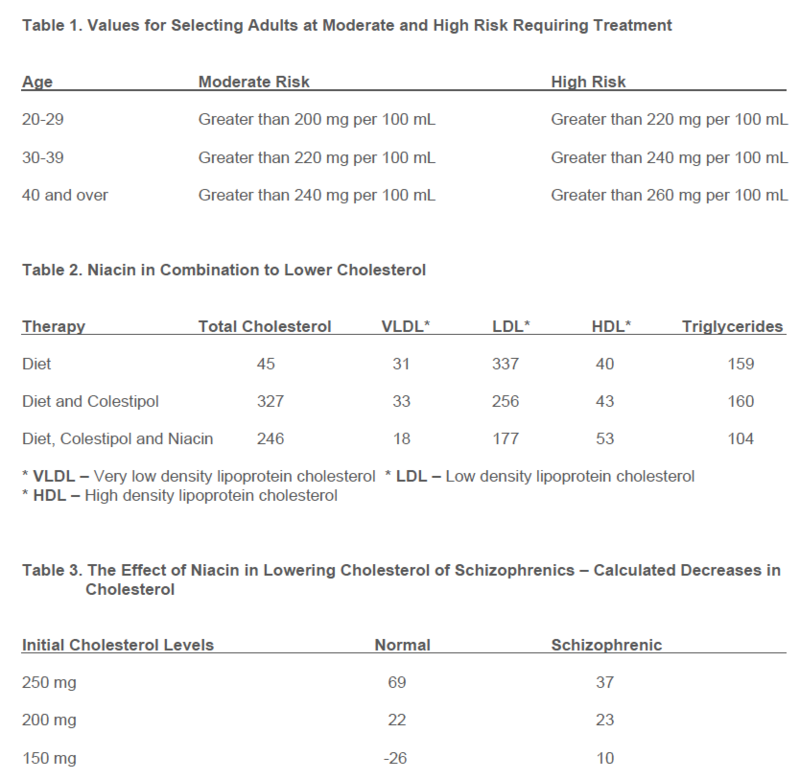 This is shown in the following table where expected decreases in cholesterol are calculated from two equations. (See Table 3 page 220.) i.e. at higher levels niacin decreases choles-terol levels more in normal subjects while at lower levels niacin did not increase the level of cholesterol. Again niacin elevated levels in normal subjects from 150 to 176, decreased it from 200 to 178 and from 250 to 181 mg.
Niacin, but not niacinamide, lowers cholesterol levels even though both forms of Vitamin B-3 are anti pellagra and are almost equally effective in treating schizophrenia and arthritis and a number of other diseases. Niacin also differs from niacinamide because it causes a flush to which people adapt readily while niacinamide has no vasodilation activity in 99 percent of people who take it. For reasons unknown, about 1 in 100 persons who take niacinamide do flush. They must be able to convert niacinamide to niacin in their bodies at a very rapid pace. There must be a clue here somewhere. It is believed that niacin causes a flush by a complicated mechanism which releases histamine, interferes in prostaglandin metabolism, may be related to serotonin mechanism and may involve the cholinergic system, Rohte, Thormahlen and Ochlich (1977). Histamine is clearly involved. The typical niacin flush is identical with the flush produced by an injection of histamine. It is dampened down if not prevented entirely by anti-histamines and by tranquilizers. The adaptation to niacin is readily explained by the reduction in histamine in the storage sites such as the mast cells. When these are examined after a dose of histamine, these cells contain empty vesicles which contained the histamine and also heparinoids. If the next dose is spaced closely enough there will have been no time for the storage sites to be refilled and therefore less histamine will be available to be released. After there is complete adaptation to niacin a rest of several days will start the flushing cycle again. This decrease in histamine has some advantage in reducing the effects of rapidly released histamine. Dr. Ed Boyle found that guinea pigs treated with niacin were not harmed by anaphylactic shock. Because the flush is relatively transient it can not be involved in the lowering of cholesterol which remains in effect as long as medication is continued. Prostaglandins appear to be involved. Thus, aspirin, Kunin (1976), and indomethacin, Kaijser, Eklund, Olsson and Carlson (1979) reduce the intensity of the flush, Estep, Gray and Rappolt(1977). It is possible the beneficial effect of niacin is not due to the cholesterol effect but is due to a more basic mechanism. Are elevated cholesterol levels and arteriosclerosis both the end result of a more basic metabolic disturbance still not identified? If it were entirely an effect arising from lowered cholesterol levels, why did Clofibrate not have the same beneficial effect? An enumeration of some other properties of niacin may one day lead to this basic metabolic fault. Niacin has a rapid anti sludging effect. Sludged blood is present when the red blood cells clump together. They are not able to traverse the capillaries as well, as they must pass through in single file. This means that tissues will not receive their quota of red blood cells and will suffer anoxemia. Niacin changes the properties of the red cell surface membrane so that they do not stick to each other. Tissues are then able to get the blood they need. Niacin acts very quickly. Niacin increases healing, as it did with my gums. Perhaps it has a similar effect on the damaged intima of blood vessels. Within the past few years adrenalin via its aminochrome derivatives has been im-plicated in coronary disease. If this becomes well established it provides another explanation for niacin’s beneficial effect on heart disease. Beamish and his coworkers (1981, 1981a, 1981b) in a series of reports showed that myocardial tissue takes up adrenalin which is converted into adrenochrome, that it is the adrenochrome which causes fibrillation and heart muscle damage. They further found that Anturan protects against fibrillation induced by adrenochrome and suggest this is supported by the clinical findings that Anturan decreases mortality from heart disease. Under severe stress as in shock or after injection of adrenalin, a large amount of adrenalin is found in the blood and absorbed by heart tissue. Severe stress is thus a factor whether or not arteriosclerosis is present, but it is likely an arteriosclerotic heart can not cope with stress as well. Fibrillation would increase demand for oxygen which could not be met by a heart whose coronary vessels are compromised. Niacin protects tissues against the toxic effect of adrenochrome, in vivo. It reverses the EEG changes induced by intravenous adrenochrome given to epileptics, Szatmari, Hoffer and Schneider (1955), and also reverse the psychological changes, Hoffer and Osmond (1967). In synapses NAD* is essential for maintaining nora-drenalin and adrenalin in a reduced state. These catecholamines lose one electron to form oxidized amine. In the presence of NAD this compound is reduced back to its original catecholamine. If there is a deficiency of NAD the oxidized adrenalin (or noradrenalin) loses another electron to form adrenochrome (or noradrenochrome). This change is irreversible. The adrenochrome is a synaptic blocking agent as is LSD. Thus niacin which maintains NAD levels decreases the formation of adrenochrome. It is likely this also takes place in the heart and if it does it would protect heart muscles from the toxic effect of adrenochrome and from fibrillation and tissue necrosis. None of the other substances known to lower cholesterol levels are known to have this protective effect. Niacin thus has an advantage: (1) in lowering cholesterol and, (2) in decreasing frequency of fibrillation and tissue damage. Altschul (1964) reviewed the uses of niacin clinically where it is used as soon as possible after an acute event. Goldsbor-ough (1960) used both niacin and niacinamide in this way. Patients with a coronary thrombosis were given niacin 50 mg by injection subcutaneously and 100 mg sub-lingually. As the flush developed the pain and shock subsided. If pain recurred when the flush faded another injection was given, but if pain was not severe another oral dose was used. Then he used 100 mg three times daily. If the flush was excessive he used niacinamide. Between 1946 and 1960 he treated 60 patients, 24 with acute infarction and the rest with angina. From the 24 patients, six died. Four of the angina patients also had intermitten claudication which was relieved. Two had pulmonary embolism and also responded. Niacin should be used before and after every coronary bypass surgery. Inkeless and Eisenberg (1981) reviewed the evidence related to coronary artery bypass surgery and lipid levels, there is still no consensus that this surgery increases survival. In most cases the quality of life is enhanced and 75 percent get partial or complete relief of angina. I believe a major problem not resolved by cardiovascular surgery is how to halt the arteriosclerotic process. Inkeles and Eisenberg report that autogenous vein grafts implanted in the arterial circuit are more susceptible than arteries to arteriosclerosis. In an anatomic study of 99 saphenous vein grafts from 55 patients who survived 13 to 26 months, arteriosclerosis was found in 78 percent of hyper-lipidemic patients. Aortic coronary bypass grafting accelerates the occlusive process in native vessels. If patients were routinely placed on the proper diet and if necessary niacin long before they developed any coronary problems, most if not all the coronary bypass operations could be avoided. If every patient requiring this operation were placed upon the diet and niacin following surgery, the progress of arteriosclerosis would be markedly decreased. Then surgeons would be able to show a marked increase in useful longevity. One would hope to have the combined skills of a top cardiac surgeon and a top internist using diet and hypo-cholesterolemic compounds. Niacin increases longevity and decreases mortality in patients who have suffered one myocardial infarction. The Medical Tribune, April 24, 2985, properly expressed the reaction of the investigators by heading their report, “A Surprise Link to Longevity: It’s Nicotinic Acid.” Had they taken Ed Boyle’s finding seriously they would not have been surprised and would have gotten even better results. Note: In 1982 Keats published my review of Vitamin B-3 (Niacin). This present review concentrates in greater detail on only one aspect of niacin’s many beneficial properties. The two should be read together as they are companion reports. Derivatives of niacin have been examined for their ability to alter lipid levels as well as niacin. It would be advantageous if the niacin vasodilation (flush) were eliminated or removed. The main disadvantage of the niacin derivatives will be cost. Inositol hexanicotinate is an ester of inositol and niacin. In the body it is slowly hydrolzyed releasing both of these important nutrients. The ester is more effective than niacin in lowering cholesterol and triglyceride levels, Abou El-Enein, Hafez, Salem and Abdel (1983). I have used this compound, Linodil, available in Canada but not the U.S.A., for thirty years for patients who can not or will not tolerate the flush. It is very gentle, effective, and can be tolerated by almost every person who uses it. Niacin is effective in decreasing the death rate and in expanding longevity for other conditions, not only cardiovascular diseases. It acts by protecting cells and tissues from damage by toxic molecules or free radicals. One of the most exciting findings is that niacin will protect against cancer. A con-ference at Texas College of Osteopathic Medicine at Fort Worth early this year, was the eighth conference to discuss niacin and cancer, Titus (1987). The first was held in Switzerland in 1984. In the body niacin is converted to nicotinamide adenine dinucleotide (NAD). NAD is a coenzyme to many reactions. Another enzyme, poly (Adenosine adenine phosphate ribose) polymerase, uses NAD to catalyze the formation of ADP-ribose. The poly (ADP-ribose) polymerase is activated by strands of DNA broken by smoke, herbicides, etc. When the long chains of DNA are damaged, poly (ADP-ribose) helps repair it by unwinding the damaged protein. Poly (ADP-ribose) also increases the activity of DNA ligase. This enzyme cuts off the damaged strands of DNA and increases the ability of the cell to repair itself after exposure to carcinogens. Jacobson and Jacobson [Hostetler (1978)] believe niacin (more specifically, NAD) prevents processes which lead to cancer. They found that one group of human cells given enough niacin and then exposed to carcinogens developed cancer at a rate only one-tenth of the rate in the same cells not given niacin. Cancer cells are low in NAD. It is not surprising that niacin also decreased the death rate from cancer in the National Coronary Drug Study. The first cancer case I treated was given niacin 3 grams per day and ascorbic acid 3 grams per day, Hoffer (1970). Niacinamide also increases the production of NAD. Three grams per day given to juvenile diabetics produced remissions in a large proportion of these young patients, Vague, Vialettes, Lassman-Vague, and Vallo(1987). They concluded, “Our results and those from animal experiments indicate that, in Type I diabetes, nicotinamide slows down the destruction of B cells and enhances their regeneration, thus extending remission time.” See also Yamada, Nonaka, Hanafusa, Miyazaki, Toyoshima and Tarui (1982). Kidney tissue is protected by niacinamide, Wahlberg, Carlson, Wasserman and Ljungqvist (1985). It protected rats against the diabetogenic effect of Streptozotocin. Clinically niacin has been used to successfully treat patients with severe glomerulonephritis. One of my patients was being readied for dialysis. Her nephrologist had advised her she would die if she refused. She started on niacin 3 grams per day. She is still well twenty-five years later. Niacin and niacinamide are protective in a large number of diseases. I will refer to one or more its ability to reduce fluid loss in cholera, Rabbani, Butler, Bardhan and Islam (1983). It inhibits and reverses intestinal secretion caused by cholera toxin and E. coli enterotoxin. It reduces diarrhea associated with pancreatic tumors in man. It is clear Vitamin B-3 is a very powerful, benign substance which is involved in numerous reactions in the body, and which in larger doses is therapeutic and preventative for a large number of apparently unrelated diseases. Are all these conditions really expressions of minor and major Vitamin B-3 deficiency states due to diet, or to accumulation of toxins in the body? It is highly likely that any human population which increased the intake of Vitamin B-3 in everyone, by even 100 mg per day and to much higher levels in people already suffering from a number of pathological conditions, will find a substantial decrease in mortality and an increase in longevity. Abou EI-Enein AM, Hafez YS, Salem H and Abdel, M: The role of nicotinic acid and inositol hexanicotinate as anticholesterolemic and antilipemic agents. Nutrition Reports International, 281:899-911, 1983. Hoffer A: The psychophysiology of cancer. J. Asthma Research, 8:61-76, 1970. Hostetler, D: Jacobsons put broad strokes in the niacin/cancer picture. The D.O., Vol. 28, August 1987, pp. 103-104. Rabbani GH, Butler T, Bardhan PK and Islam A: Reduction of fluid-loss in cholera by nicotinic acid. The Lancet, December 24CE31, 1983, pp. 1439-1441. Titus K: Scientists link niacin and cancer prevention. The D.O., Vol. 28, August 1987, pp. 93-97. Vague PH, Vialtettes B, Lassmanvague V and Vallo JJ: Nicotinamide may extend remission phase in insulin dependent diabetes. The Lancet, 1:619-620, 1987. Wahlberg G, Carlson LA, Wasserman J and Ljungqvist A: Protective effect of nicotinamide against nephropathy in diabetic rats. Diabetes Research, 2:307-312, 1985. Yamada K, Nonaka K, Hanafusa T, Miyazaki A, Toyoshima H and Tarui S: Preventive and therapeutic effects of large-dose nicotinamide injections on diabetes associated with insulitis. Diabetes, 31: 749753, 1982.